What is a Tracked Dumper? A tracked dumper (also known as a carrier or loader) is exactly what it sounds like. Try and think of a wheelbarrow on tracks that you can drive, or a mini tank used for moving material rather than artillery and you’re halfway there. It may seem like simple technology, but these machines can really set yourself and your business apart from your competition. The tracks allow them to work in areas wheeled dumpers would usually struggle, such as soft ground or boggy wet areas. The increased surface area will distribute weight more evenly, ensuring that you won’t get stuck. Here at MTS Plant, we have a range of tracked carriers, from the mini Yanmar C08 up to the larger Yanmar C30R-3TV, these dumpers will allow you to complete jobs in a fraction of the time and help you become more efficient and productive on site. There will be no need to work yourself into the ground, transporting materials from one area to another, as both versions of the mini C08 can move up to 10 times more weight (560kg-770kg) than your conventional wheelbarrow. Which Tracked Dumper suits you best? The size of the dumper will all depend on the size of the project at hand. 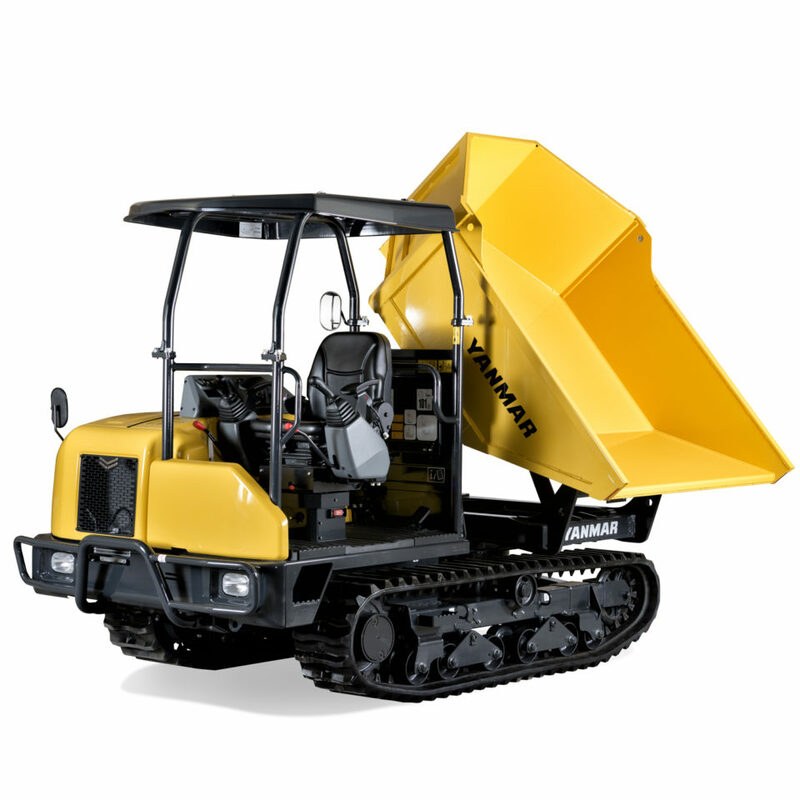 The mini Yanmar C08 Hi-Tip offers plenty of versatility for projects including landscaping, demolition, renovation, and agriculture. With its smaller size, it is capable of manoeuvring down the side of houses, working in limited access sites and confined spaces. If your project is a little larger and you have more rubble and earth to move, then a larger carrier will be more beneficial. Here at MTS Plant, we offer three larger options. The Yanmar C12 with a payload of 1150kg and capable of three-way tipping. Whilst both the Yanmar C30R and C30R-3TV have a payload of 2500kg. With this said, all our tracked loaders are still small enough for limited access work sites, with our largest machine having a width of only 1565cm. There are many benefits to adding a tracked dumper to your business operations. With the tracks you have the added benefit of an increased surface area giving you greater stability, so whether you are traversing up and down slopes or over rough ground, you’ll be safe in the knowledge that you won’t topple over. With this increased surface area comes an increase in load capacity as the weight is spread more evenly across the tracks. Decreasing your chances of becoming stuck in soft muddy conditions. Move tools and equipment around your worksite without the added labour. Simply load up the cargo box and transport them to your destination. Transporting the dumpers themselves is easy enough with their small size, even the C08 can be loaded into a van and carried away to its next job. There has been a recent increase in demand for tracked dumpers due to a variety of reasons. They minimise the damage to ground surfaces when travelling over soft terrain and with construction companies becoming more environmentally aware, their popularity is becoming greater by the year. No matter the application they are designed with the robustness to take on the most demanding of jobs. The efficiencies offered by investing in tracked dumpers vs handling rubble and debris via traditional methods often allows contractors to free up employees to complete other tasks improving your team’s overall productivity. So, what are you waiting for? Don’t get left behind in the dirt and mud. At MTS Plant we have Yanmar tracked dumpers available now to hire or to purchase helping your business stay ahead of the game. Contact the MTS Plant team today to discuss your requirements and learn more about our new range of Yanmar Tracked Dumpers. MTS Plant have over 30 years of experience within the plant hire and sales industry and have machines to fit all your needs and applications with the accessories and service to match.